Having a tapa of raw fish macerated in vinegar is surely not quite luring for some stomachs. Mediterranean anchovies are not just gutted fish salted in brine, matured and canned or bottled in oil or salt as those you find in the market. They are also served fresh and marinated in vinegar as the ones in the picture. This exquisite tapa is called Boquerones en vinagre. By now you probably have guessed that not all anchovies prepared this way taste the same and that both the freshness of the fish and the quality of the vinegar really make the difference. 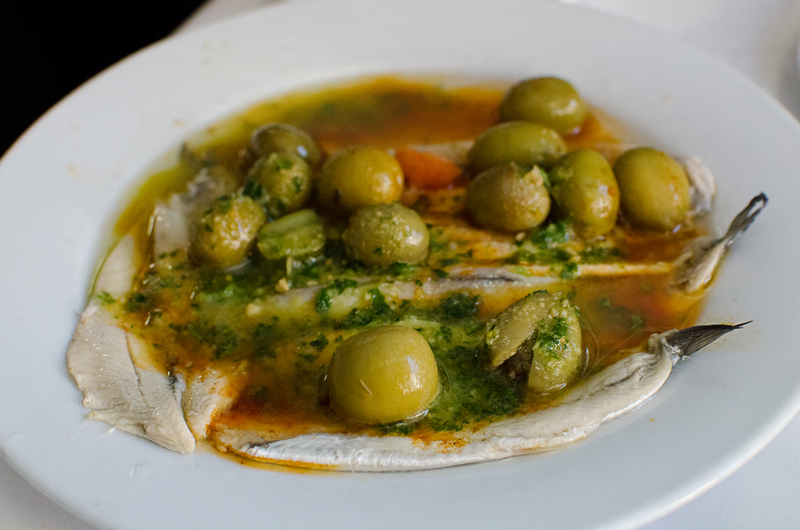 Yesterday, we enjoyed these superb boquerones en vinagre dressed with garlic, parsley and some olives at Rincon de la Ciudadela, exactly at the corner of carrer Princesa and carrer Comerç in El Born, Barcelona. The restaurant is not modern, chic and trendy like many others in the area, but you know, good food, is not always in the coolest place. This is a lovely dish! I will have to get into this food photo thing, as soon as I have something this great looking to eat! The olives are the only things I recognize in the dish. Or are those peas? I won't be back to visit or to leave comments. Why? You have word verification turned on. It is hard to decipher the words. Why do you want to punish people who do stop and want to leave a comment, why punish them with hard to decipher words? I thought it is nuts and for that reason, I turned my word verification off. I will try one time to decipher the words and if you are reading this then I was able to decipher them. But I won't be back unless it is turned off. Hello Abe, I see your words do honor your nickname. I like honesty. I will see why I chose captchas. I am sure it was because of spammers getting on my nerves. But I am going to check settings. I appreciate the advice. I find it funny you menace with not coming and I do take it as a kind tip. Please do come back. Thanks! There you are Abe, no word verification applied. If you are reading this is because you did come back. Nice tip! I did not know you were such a so good photographer. Congratulations!! Anchovies are not my favorite food. But your photo will make me reconsider my boycott of this salty fish. Of course, that means revisiting Barcelona to get only the freshest offerings. p.s. Thanks for turning off word verification. I did it months ago and have had no security problems.